There are some events in the history of nations when all segments of society, irrespective of their differences, come together and unite for a common purpose. Same happened in Pakistan when on 16th December the tragic massacre in Army Public school Peshawar brought the entire nation on one page. All the political parties; both from government and opposition benches, military leadership, civil society and people at large from all walks of life expressed their desire of wiping out terrorism from the country once and for all. This unprecedented unity and national consensus is significant because all stakeholders of the state, for the first time, collectively declared terrorism in all its forms and manifestations including that organized on the basis of religion and sect as the principal national security threat to Pakistan. 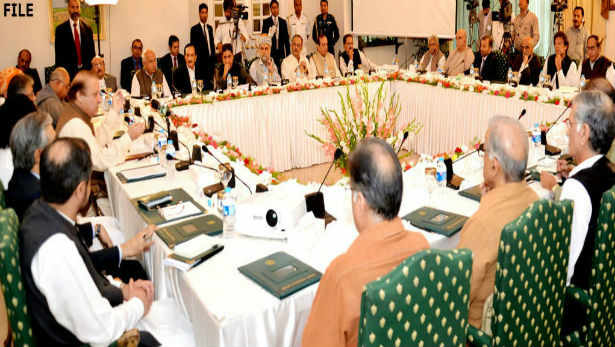 Against this backdrop, the government initiated the national action plan and parliament unanimously passed the 21st amendment to the constitution. Under the 21st amendment, any person who is, or claims, or is known to belong to any terrorist group, or organisation using the name of religion, or sect and raises army, or wages war against Pakistan, or attacks the armed forces of Pakistan and law enforcement agencies, or attacks any civil or military installations in Pakistan would be tried under Army Act by the military courts. The national action plan envisaged 20 points, both short term and long term, for effectively tackling the menace of extremism and terrorism in the country. Establishment of military courts is just one out of theses 20 points while implementation on other points is also the responsibility of the government and political leadership which should not be deferred to a lower priority. We should not forget that the recent Shikarpur suicide attack is a telling reminder that the terrorists have not been deterred by the government’s recent decisions of lifting the moratorium on the death penalties and search operations leading to the apprehension of suspected terrorists. Obviously, those who have been brain washed to death would not be threatened by these measures. The irrationality cannot be cured through symptomatic surgery. It needs a thorough diagnosis and sustainable treatment. It is true that in extraordinary circumstances that threaten the integrity of the state, the governments do call the military for help and in the case of Pakistan where the military has proved its professional competence and organization, it was quite natural that it was to be given a special role even in the judicial business of the state. But, to make sure the temporary nature of the military’s role in criminal jurisdiction, the time frame for the establishment of military courts has been kept limited to two years. However, for a sustainable remedy the government needs to focus its attention towards law enforcing agencies and the overall socio-economic conditions of the country. It would be important to understand that the performance of the department of police and judiciary is crucial in the fight against terrorism. The operations launched by the Army in all parts of the country and the recent establishment of military courts are a testimony to the fact that these institutions have not been able to deliver. Owing to their direct links to the society, their significance in the war against terrorism cannot be sidelined. The government needs to unearth the reasons behind the ineffectiveness of these two important departments in checking the scourge of terrorism. The strength of the military as an organization is well recognized all over the country. The military has been able to develop a strong institutional framework with no internal politics, merit and efficiency based career development and social security of their employees. A soldier fighting at the border or against terrorists on the inner front is owned by the military. On the other hand, a policeman and a judge is an individual with no departmental support and ownership. There are huge budgetary allocations to these departments but the funds do not trickle down to institution building and infrastructure development. Police remains poorly equipped to fight sophisticated, well trained and fully armed terrorists. In case of the judiciary, the judges have no personal or family security. Same is the case of the witnesses who dare not come forward owing to the dire consequences of their evidence. There is a great realization of reinforcing police and many positive developments are taking place. Recently Sindh government has announced special incentives for the police and is trying to improve their working conditions, it is encouraging but still a lot to be done. A comprehensive upgradation is required in all law enforcing agencies of the country in all the provinces to make them compatible with the contemporary challenges of terrorism. It is worth understanding that the root causes of terrorism and extremism are deeply entrenched in society. The socio-economic conditions of the country are a major contributor to the criminal status of the society. We have a society where youth, after obtaining their degrees, run from pillar to post for jobs and end up with rejections, a country where frustrated people have to wait in queues for long hours just to fuel their vehicles, a system where power shut downs have made the life of common man miserable, a culture where corrupt practices for material well being leave behind the least of moral values. The dejections, frustrations, disappointments and miseries provide the ideal environment for extremism to flourish. When people are disowned by the state they are disintegrated. Disintegrated elements of the nation takes support of the ethnic, sectarian and sub-national loyalties making ground fertile for the extra territorial elements for creating cleavages in the state. The provisions of the national action plan are reasonable, but their implementation needs strategic vision and farsightedness. A comprehensive policy has to be drawn and effectively implemented to wipe this menace out. Registration of Afghan refugees and all illegal foreigners in the country and their early return, comprehensive education reforms in madrassas, check on all foreign funding of terrorists and their sympathizers are some of the major steps that will help improve the situation. It is disappointing that the pace of implementation on the national action plan has rather been slow. It calls for strong political will on part of the government and all political parties to push forward and get things done irrespective of the cost and consequences. The immediate surgery for halting the symptomatic problem of terrorism through military courts is justified under prevailing extraordinary circumstances for the short term but in the long term, the socio-economic causes behind extremism and terrorism have to be addressed. Only then, the nation would become a bulwark against all sorts of disintegrated tendencies. But for that to happen, the state would have to take responsibility of the socio-economic uplift of the society. The unity achieved in the aftermath of the Peshawar massacre needs to be strengthened further by aiming for the long term, all comprehensive and sustainable solutions to the problems. In this context, all elements of national power have to be fully utilized and everyone has to be taken on board for their respective contributions. The primary responsibility is that of the government, but the intelligentsia has to play an instrumental role in diagnosing the actual problem and prescribing workable solutions to the existing socio-economic and institutional problems of the country. There is an urgent requirement that the government should establish a continuous linkage with academia to allow quality research so that necessary policy advice may be available at all crucial junctures of national decision making.